You’re in for a treat as your ship sails through Resurrection Bay near Seward. The area is home to wondrous marine mammals, birds and fantastic tidewater glaciers. But this is just the beginning of what Alaska has in store. Spend a few days exploring the surrounding area and you’ll open doors to new cultures, flavors and inspiring sights you won’t get while your ship is underway. The cruise may be over, but the adventure has just begun! The Alaska SeaLife Center in Seward cares for sea lions, seals and puffins, among other marine animals. You’ll get a unique perspective on life on and below the waves in Alaska. Board the Alaska Railroad for the trip to Anchorage. Keep an eye out for moose and eagles as the train winds through forest valleys and past stunning hanging glaciers in the Chugach Mountains. White Beluga whales ply the waters of Turnagain Arm for salmon, so keep an eye out on the left side as you head north. Hop off in the mountain town of Girdwood and spend the night in a cozy room at a B&B, or at Alyeska Resort. Girdwood is well known for hiking and glacier trekking. Don’t be surprised if you spot paragliders overhead or mountain bikers speeding down the mountain slopes. Start the day with a hearty breakfast. For local flavor, check the menu for reindeer sausage and sourdough, two iconic Alaska tastes that shine at breakfast time. Head north to Anchorage by bus, but keep an eye out for white Dall sheep on the slopes of the Chugach Mountains. If you time it right, you may also see the bore tide in Turnagain Arm, it’s a sweeping wave that can get as large a six feet tall as it travels down the arm. Get your bearings in the city of Anchorage with a trolley or walking tour of Anchorage. You can learn about the city’s history, diverse cultures and cuisine, and you might even spot a moose browsing through parkland. You may already have caught a glimpse of Denali from downtown, but it’s about to get a lot closer. Take off for the Alaska Range with a flightseeing trip. Lake Hood is the busiest seaplane base in the world, and many companies offer tours. You’ll circle the iconic mountain, soar over huge ice fields, and may even get a chance to touch down inside Denali National Park! Get a little creative inspiration at downtown galleries along Fourth Avenue and G Street. You’ll find traditional Alaska Native art, contemporary works by local artists and inspired apparel. If you’re looking for a souvenir or gift from Alaska, now’s the time; Anchorage has no sales tax! 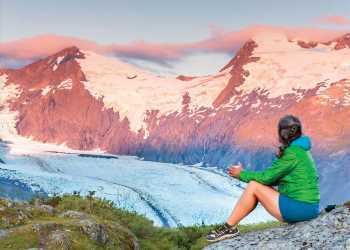 The Alaska Culture Pass gets you into two great attractions for one price and offers a shuttle service to boot! Anchorage is the only city where you can explore all of Alaska’s Native cultures in one place. Head to the Alaska Native Heritage Center for demonstrations of Alaska Native dance, drumming and sport, then explore the life-size traditional dwellings in the forest that surrounds Lake Tiulana. The Anchorage Museum is the largest in Alaska, and its history, art, Native culture and science exhibits are inspired. Time for a meal as artful as anything on a gallery wall. Sample fresh Alaska seafood, locally sourced veggies and beers brewed in Anchorage. Choose from a wealth of intimate restaurants, charming bistros and fine dining spots to celebrate your Alaska voyage!